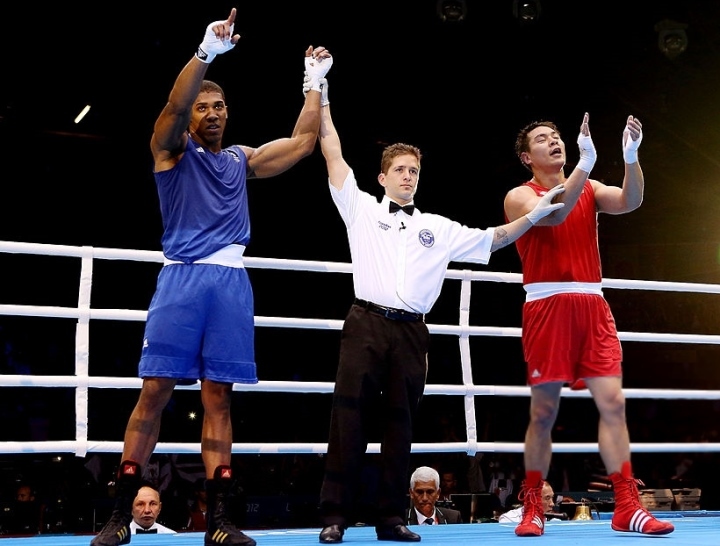 PATERSON, N.J. – Zhang Zhilei is thinking about Anthony Joshua as the huge Chinese heavyweight trains far from the bright spotlight shining on the British superstar. While England’s Joshua is getting ready for another heavyweight title fight before a stadium full of adoring fans Saturday night in Cardiff, Wales, Zhilei is preparing for his own breakout year at a boxing gym in this gritty city about 25 minutes outside of New York. The 2008 Olympic silver medalist hopes that by the end of 2018, he gets an opportunity to avenge his loss to Joshua in their super heavyweight fight at the 2012 Summer Olympics in London. Joshua (19-0, 19 KOs) and Zhilei (18-0, 14 KOs) have similar records and are exactly the same size (6-feet-6, roughly 250 pounds), but they have taken vastly different professional paths since Joshua won their bout by a slim margin, 15-11, five years ago in London. While Joshua was fast-tracked toward a career-changing knockout of long-reigning heavyweight champion Wladimir Klitschko on April 29 at London’s Wembley Stadium, Zhilei has been brought along at a much more moderate pace by Jay Z’s Roc Nation Sports. The 34-year-old Zhilei has been very active since making his pro debut in August 2014, but mostly has fought journeymen or worse while building his record and learning to box like a professional. His handlers, Roc Nation’s Dino Duva and manager/trainer Shaun George, hope to match Zhilei against a ranked heavyweight when he returns to the ring December 9 in Guangzhou, China. After a first-round technical knockout of Byron Polley (30-22-1, 19 KOs, 3 NC) on September 23 in Park City, Kansas, the powerful southpaw feels he is more than ready to take on more daunting challenges in the ring. George, a retired light heavyweight contender who has worked extensively with Chinese Olympic teams, is encouraged by Zhilei’s development. “I would say within a year Zhang [pronounced John] will be ready to fight any one of those guys,” George said. “He’s very bright, very smart. He adapts well and he can really fight. Zhilei is ranked No. 8 by the WBO, which means he is in best position to challenge New Zealand’s Parker (24-0, 18 KOs) for his title. Joshua owns the IBF, IBO and WBA championships, and Zhilei is not ranked in the top 15 by any of those three organizations. The hard-hitting contender clearly wants to move into position to avenge his loss to Joshua, though. Watching Joshua’s career closely, particularly seeing him get off the canvas to stop Klitschko in their unforgettable fight, has made George understand that beating Joshua won’t be easy if Zhilei gets that opportunity. “What Anthony Joshua has been doing is very impressive,” George said. “He’s a young heavyweight who can really punch and do everything else. We’re not underestimating Anthony Joshua. We’re aware of what he’s doing. He’s doing great things for the sport of boxing. If Zhilei can beat Joshua or win one of the other heavyweight titles, he, too, can become a huge star in his home country of nearly 1.4 billion residents. Chinese sports fans have embraced boxing, a relatively new sport there, in recent years and have strongly supported Chinese champions in lower weight classes. Former WBO flyweight champion Zou Shiming, Zhilei’s longtime Olympic teammate, is the most notable among them. Like fight fans everywhere, they love heavyweights, which leads Zhilei’s handlers to believe he can become boxing’s answer to basketball legend Yao Ming in China. Though he stands a full foot shorter than the 7-feet-6 former Houston Rockets center, Zhilei is often mistaken for Ming by American sports fans. Duva and George also want to capitalize on the large concentration of Chinese-Americans in the New York metropolitan area by showcasing Zhilei on cards there. The two-time Olympian didn’t turn pro until he was 31, yet remains relatively young for a heavyweight. Duva and George think this is the perfect time to begin exposing Zhilei to bigger audiences, against tougher opposition. He should fight his way to the top and at the right time he may get Joshua. He needs to come into the limelight. Whatever happened to that Taishan dude? He's with Roc Nation: Has Roc Nation helped anyone's career?